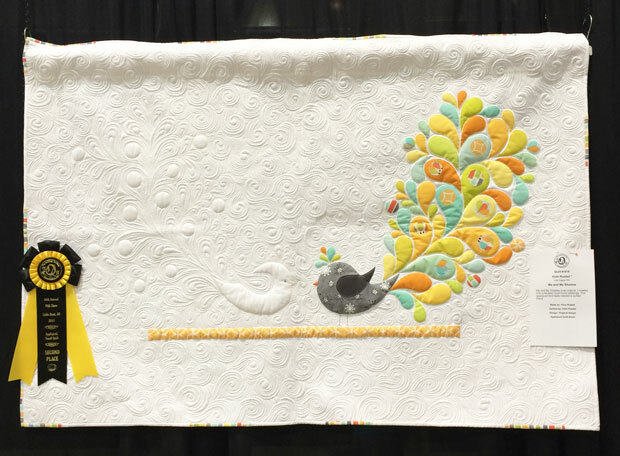 I just returned from teaching for the National Quilting Association‘s annual quilt show in Little Rock, Arkansas and it was such a great time for both me and my students! Each time I teach, it rejuvenates me and rekindles my love for the craft! Here are some eye candy pics from my weekend. Students showing off their Modern Logs blocks after a fun day of sewing! I taught two classes: Modern Logs and Modern Machine Quilting. The students had a great time exploring their creativity and I’m sure I had just as much fun as they did! 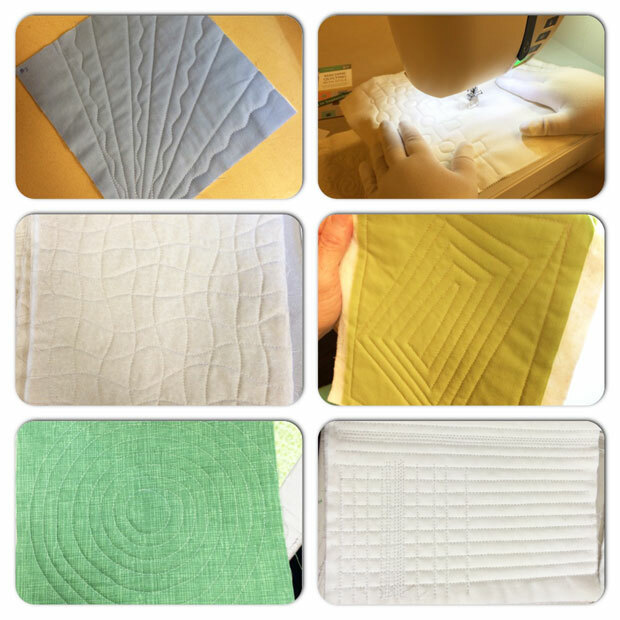 Student practice samples from Modern Machine Quilting. I love the texture they created! 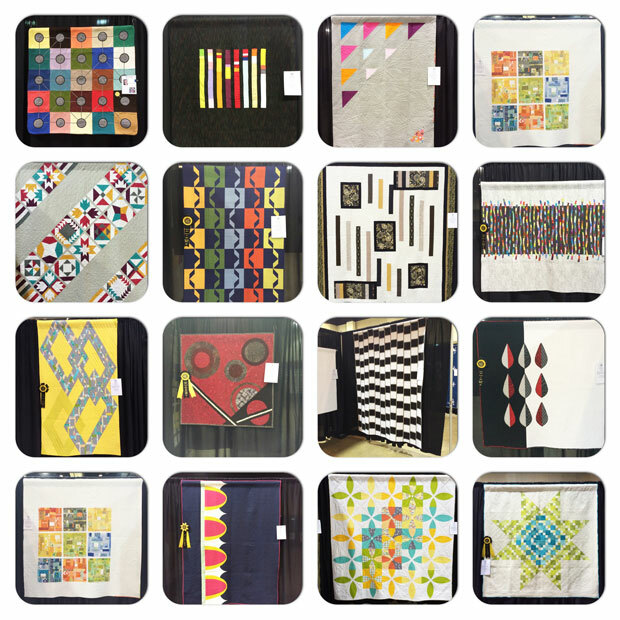 A great showing of modern quilts including my entry, Optical Illusion in the 3rd row. I was thrilled to see ribbons on many quilts of friends and acquaintances I admire! I follow Margaret Solomon Gunn’s blog and her writings in Machine Quilting Unlimited magazine. 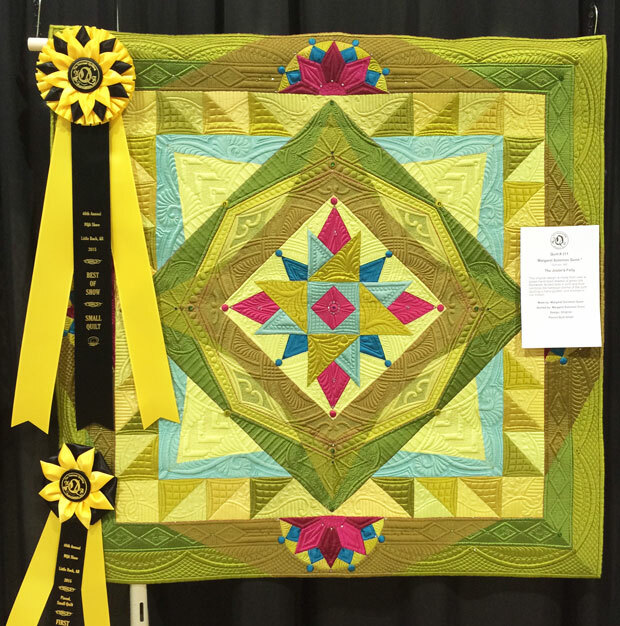 Although her style is vastly different from mine, she’s an amazing quilter who won Best of Show – small for her quilt Jester’s Folly. She also won a Masterpiece Quilt award, which you can read about on her blog here. I was so proud of my friend Vicki Ruebel from Orchid Owl Quilts for getting ribbons on 2 of her quilts in the show! Me and My Shadow picked up 2nd in the Small Applique Quilts category and her Big Star quilt (in the modern montage above) won 2nd in the Modern category. 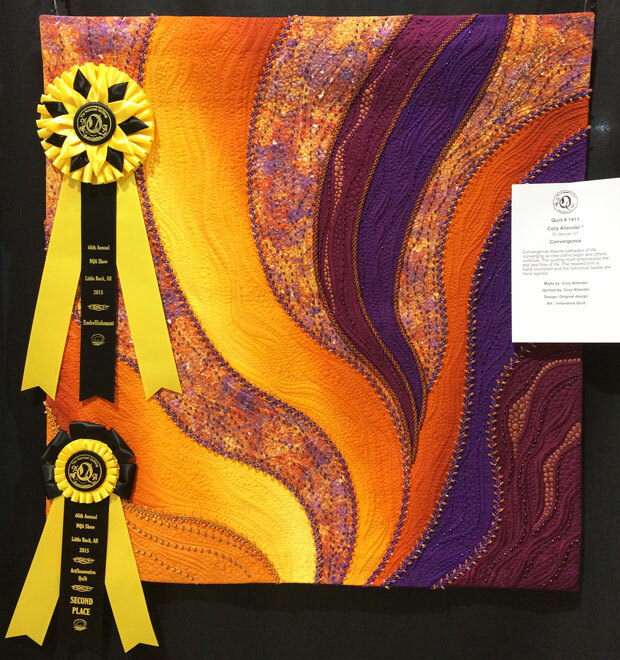 I was also thrilled to see a top prize ribbon on my friend Cory Allender‘s quilt, Convergence. Cory’s work is nothing short of amazing, and she’s the one who first encouraged me to start entering my quilts into national shows. Just about every time Cory enters a quilt, she picks up a ribbon. I love it! 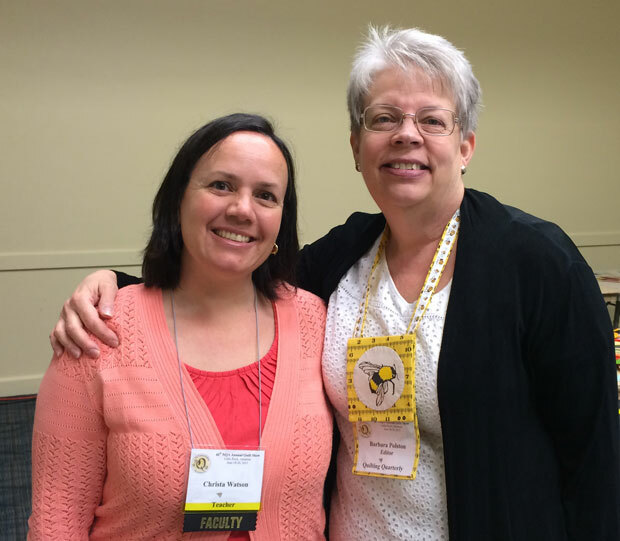 A fun part of any show is getting to meet up with other like minded quilters. I was able to hang out with Jodi Robinson and Gina Perkes and for a bit one evening and swap quilting stories and inspiration. They are both amazing long arm quilters and I’m super excited for what they have coming up, so be sure to follow them, if you don’t already. 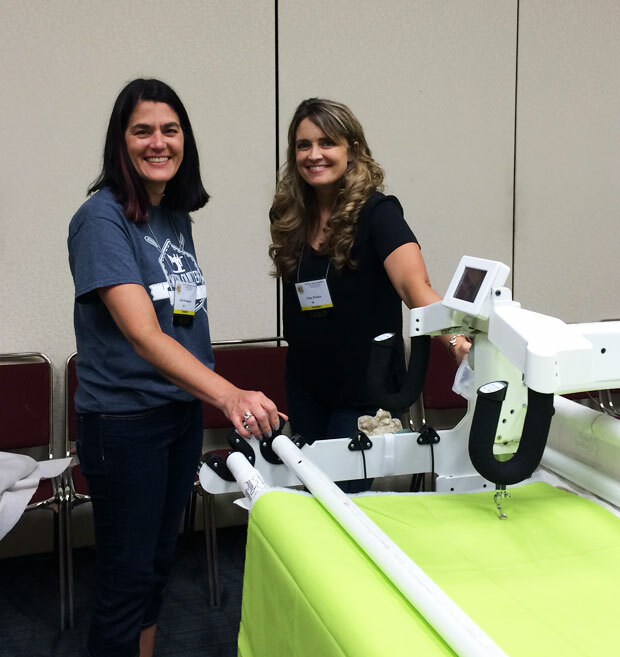 Jodi Robinson and Gina Perkes, two amazing long-arm quilters whose work I admire. As a teacher, NQA took care of my accommodations which were super nice! I was roommates with another fabulous quilting instructor, Sue Rasmussen who specializes in Domestic Machine Quilting (whoo-hoo) and one-of-a-kind landscape art quilts. She’s self-published a book that includes tons of great info on the technical aspects of quilting, so of course I snatched up a copy! Hanging out with Sue Rasmussen in our hotel room after a fun day of teaching. And finally, I can’t give enough thanks to the staff and volunteers of NQA who helped make my time there a success! I was able to connect with many of the people I’ve only worked with online and through emails. Meeting them in person was such a treat! 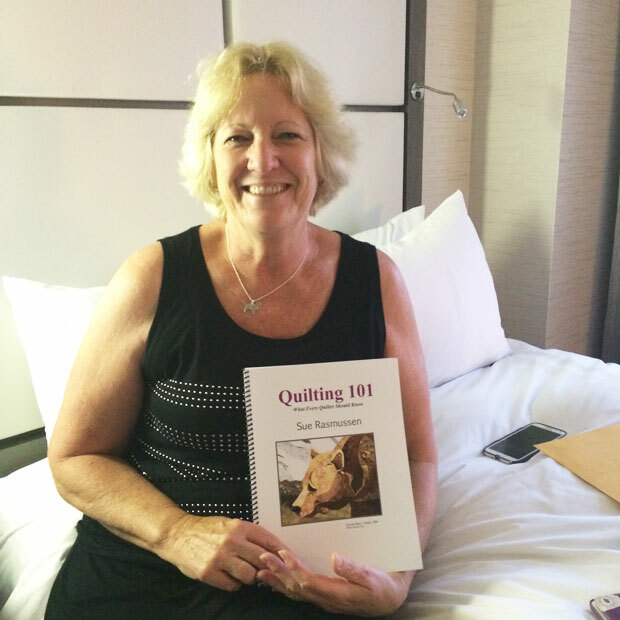 Barbara Poslton is the editor of NQA’s Quilting Quarterly magazine. She’s a doll! If you ever get a chance to visit a national quilt show, I highly recommend it! 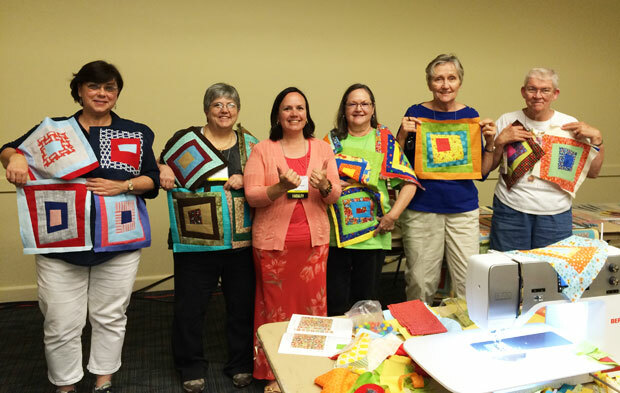 QuiltCon Class Registration Opens June 25! I love reading about such nice times as this. 🙂 Thanks for sharing some featured quilts – I love Margaret’s work, and now I have a couple of new quilters to follow as well. Love the quilts, especially Me and My Shadow and Gunn’s (way over my ability), and of course, yours. I’m really liking the red white & blue and next to that the aqua turquoise & teal blocks. Very cool. It looks like you had a great time. The quilts are beautiful.